For being the most anti-religious genre of metal, black metal sure behaves like a religion sometimes -- not only on the occasional forum debate, but in many bands' strict comformation to the traditions laid down by pioneering predecessors. 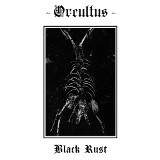 Take Swedish black metallers Orcultus. Secretive members? Check -- they won't even give out pseudonyms. Lo-fi production? Check. Endless demos and EPs? This is the third demo this year! Black Rust, their latest demo, is even released on hand-labeled cassette tape, which even the nostalgics among us don't particularly want back. But the distribution format matches the music on the album, which is pretty much an exact copy of Norwegian black metal of the early 90s. Think Darkthrone, Gorgoroth, maybe a bit of Mayhem thrown in, and you have exactly what the sound consists of: Buzzing guitars with a lo-fi sound, drums buried under the wall of noise, and a shrieking vocal line rasping out completely incomprehensible lyrics, which consistently mirrors the grinding of the guitars. Purifying Plague has very little tune to it, just an undulating back-and-forth melody that goes nowhere in particular, but the title track is much more interesting; it's still fairly slow and steady in rhythm, but in all the guitar noise a melodic riff somehow bubbles up and hijacks the song partway through. Cold and Silent behaves differently too, with a cold, lonely lead that starts the song with long sustains and then pushes the melody along a path that, if a bit well-worn, at least provides us with the proper atmosphere. Incidentally, there is some admirable restraint here on the tremolo picking and double-kick drum use, too, which I didn't expect given the willingness of Orcultus to showcase any trait of bygone black metal luminaries in their own music; instead, they keep their drumming to simple, primitive beats with the guitar background matching that slower rhythm. This interest wanes a bit on some of the other songs. Filled With Flies and The Void stick to safety and don't do anything more than provide a basic template for some three-chord riffs, and the final track, which switches from a fast beat to a slower 3/4-time beat halfway through -- and then proceeds to do nothing with it -- is similarly dull. It seems like the ability to write a melodic hook, though probably scorned by a band with as little interest in compromise as this one, would probably help them out greatly. Overall, this isn't anything to be particularly interested in unless one is so deeply into early 90s black metal that later imitators -- not only of the genre but of the scene's tropes of that time -- are appealing. Maybe this is a bit unfair of me, especially given that the slogan of the band's label is "Where The Past Is Alive!". But to me, this is the black metal equivalent of an American Civil War reenactment -- interesting to some who are obsessed with a particular time in history, but weird and unnecessary to most. While I can see a few people interested in this sort of thing, most would probably do best to leave this one alone.